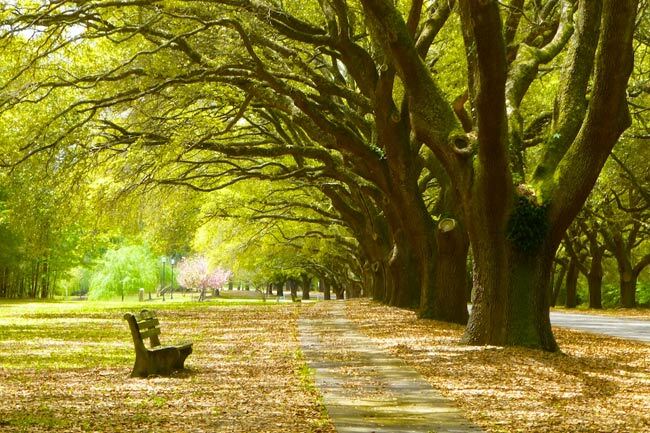 Live oak trees (Quercus virginiana) – also called Southern live oaks or Virginia live oaks – are most often associated with the coast in South Carolina, though the evergreen species can grow throughout the state. The tree, known for its expansive branches, grows abundantly in maritime forests and along the coastal plain, as it favors warm and humid conditions. 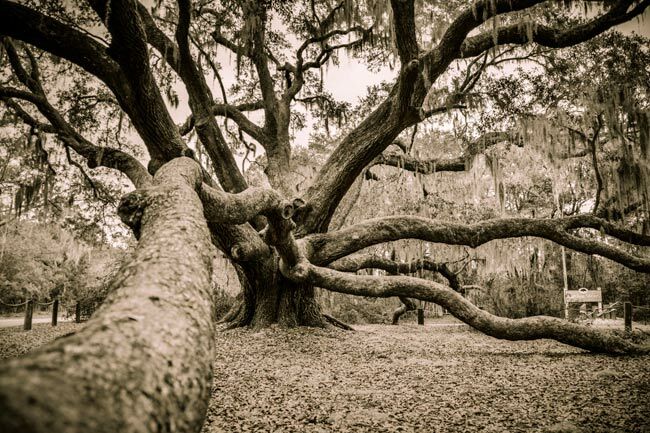 Because the tree has adapted to withstand coastal storms, a live oak’s height generally reaches just 40 to 80 feet while its limbs can span up to one hundred. These proportions help prevent the tree from toppling in the event of a hurricane and also lend the live oak its enigmatic appeal – as seen in the tree above, located in the Carolina Shores community of Beaufort and featured the movie The War, a 1994 film starring Kevin Costner. The live oak can withstand other harsh coastal conditions as well. The tree’s waxy leaves tolerate salt spray, borne by oceans and creeks, and retain their deep green color almost all year, giving the tree its common name, live oak. Live oaks are not true evergreens however; they replace their leaves briefly each spring over a course of two to three weeks. 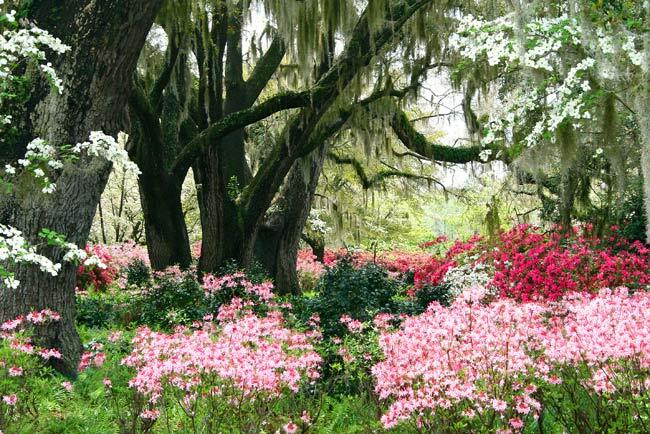 This replenishment period generally coincides with the blooming of azaleas and dogwoods, and during this time, the trees sport bright green leaves instead – as well as masses of olive-hued pollen! An oak’s limbs often rest on the ground – as seen in the two photos above, which feature the renowned Angel Oak of Johns Island – and are stabilized by their own weight. Live oaks grow well in sandy soil and shade, traits of the coastal plain and the understory of a slash pine (Pinus elliottii) forest – common natural communities for live oaks. 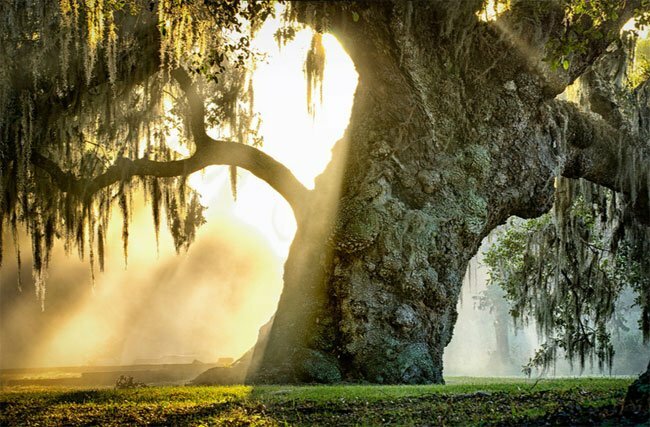 The live oak grows quickly when it is young, at a rate of about two to two-and-a-half feet per year. However, the rate of growth slows as the tree matures, and its trunk diameter – which averages six feet – is typically reached at around 70 years. 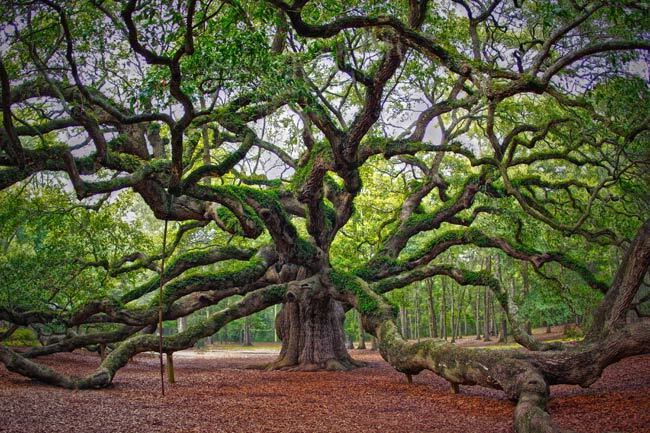 The average life span of a live oak is around 300 years, though in the right conditions, many can grow much older – even to a thousand or more years. The live oaks that line the Methodist Oaks Retirement Community in Orangeburg, seen above, were planted as ornamental shade trees, but their proximity to the Edisto River allows them to flourish. 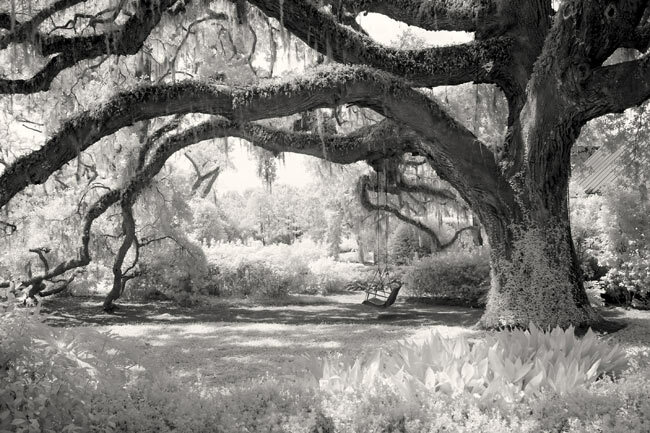 Live oaks often are planted as ornamentals in places other than the coast. The tree can endure cooler climates, but will grow more slowly the further away from the coast it is planted. Live oaks do not tolerate freezing weather but can withstand the cold temperatures experienced in the Piedmont and other regions of South Carolina. 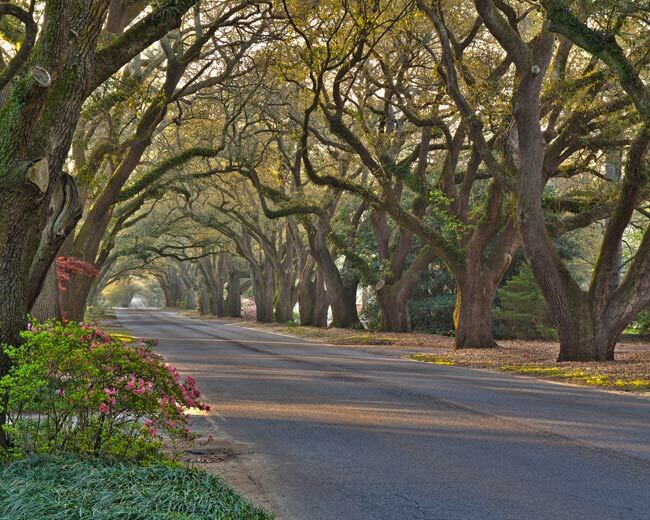 South Boundary Avenue in Aiken, above, is canopied with thriving oak trees and is one of the state’s signature residential roads. That said, live oaks are never so grand as they are near the coast. 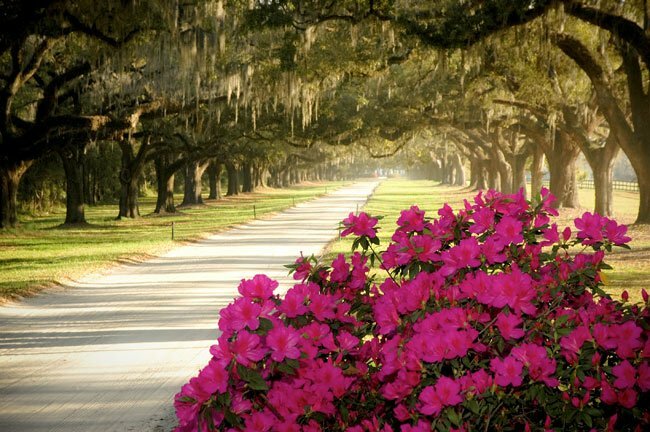 The avenue of oaks at Boone Hall Plantation in Mount Pleasant, above, was planted in 1843 but looks as though it has been around since the land itself. Unlike live oaks in other regions, Spanish moss (Tillandsia usneoides) hangs from the limbs of coastal trees. An epiphyte, Spanish moss – which is neither Spanish nor a moss – grows profusely in the South Carolina Lowcountry as well as other humid places in the Southeast. The plant, which produces a nearly unnoticeable lime green flower, lives on the tree’s branches but does not siphon nutrients from the tree. It can shade out the lower leaves of a tree already in decline, which can further the decline of the tree. However, the Spanish moss itself is not the cause for initial decline in an unhealthy tree. 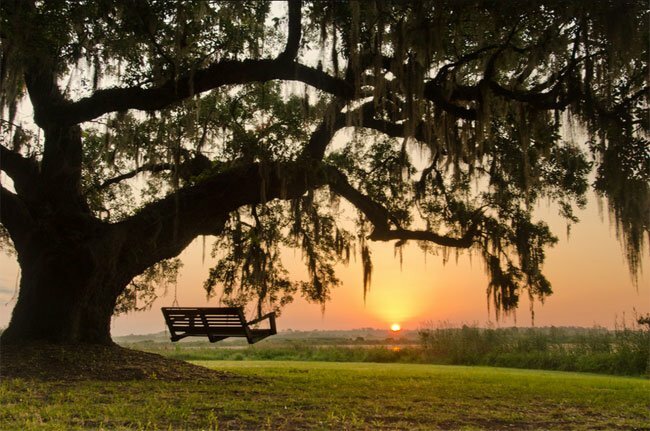 There is nowhere better to enjoy our state’s beauty than from the shade of a giant live oak. This one is located at Mansfield Plantation in Georgetown County. Here, live oaks grace the fields at Colleton River Plantation in Beaufort County. 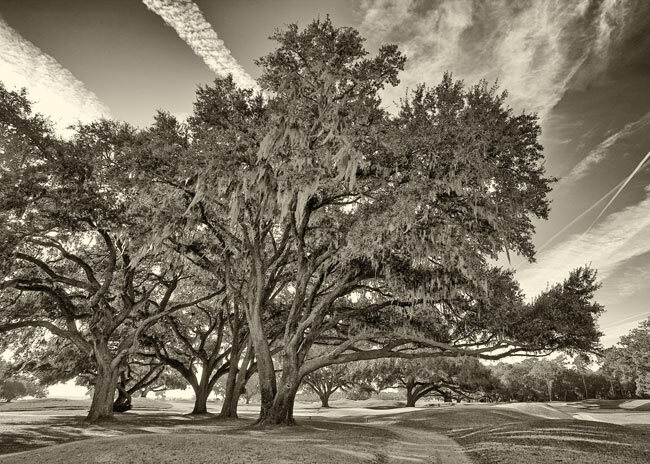 The McLeod Oak at James Island‘s McLeod Plantation is one of the largest and most majestic live oaks in our state. It stood sentry to the Charleston headquarters of the Freedman’s Bureau following the Civil War. Above, another swing welcomes visitors to rest beneath the limbs of a stately live oak, this one in Okatie‘s Oldfield community. Lives oaks living nearest the coast can succumb to the sea as barrier islands shift and ebb. Even in death their form takes on a haunting, sculptural beauty. 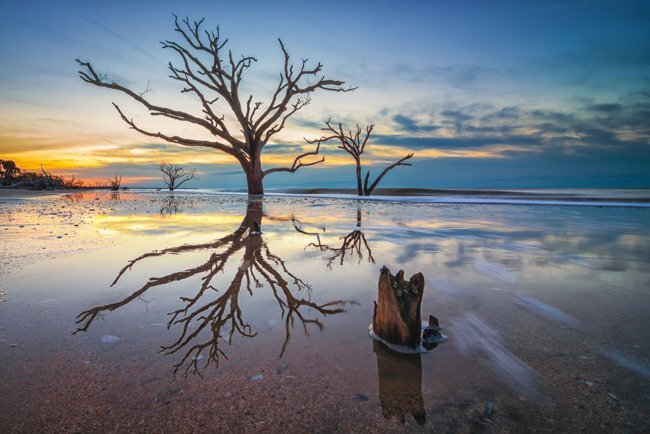 The tree above stands at Botany Bay on Edisto Island. From a quick search, we are not sure that data on the longest limb is available. Typically the entire tree is measured and the term “largest” is applied to its overall measurements. What is the longest unsupported oak tree limb east of the Mississippi? The US? In the credit below each photo, the photographer’s name is listed, is a link that will take you to their website. Some photographers don’t have websites, however, in in those cases we can try to get you in touch. Do you have any particular photo in mind? Where can I buy prints of these prints or photos to frame? Oak trees on Johns island have colored ribbons on them recently put there by a city crew especially on Salvo Lane, what do they mean? Same type, but not the same tree. MOst cities have tree ordinances, so you would shave to check with your municipality. Is it legal in SC to cut down oak trees? Hi, Kathryn. The live oak seen in the Kevin Costner movie is another spectacular SC oak seen at the top of the page at this link: http://www.sciway.net/sc-photos/beaufort-county/live-oak.html It is the live oak at the entrance of the Carolina Shores subdivision in Beaufort. 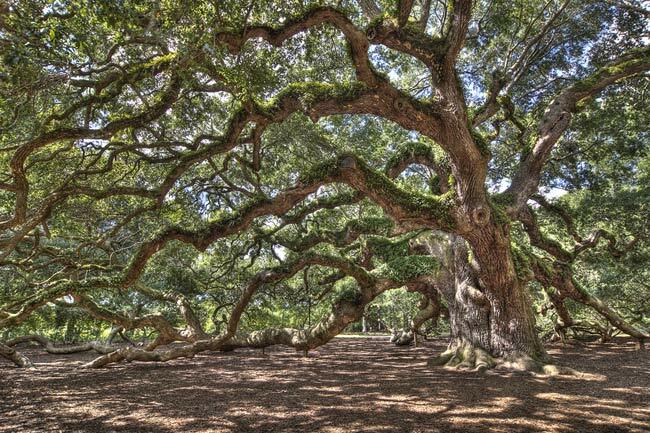 Many say it is the twin of the Angel Oak! Is the Angel Oak the same tree as in The War movie with Kevin Costner? 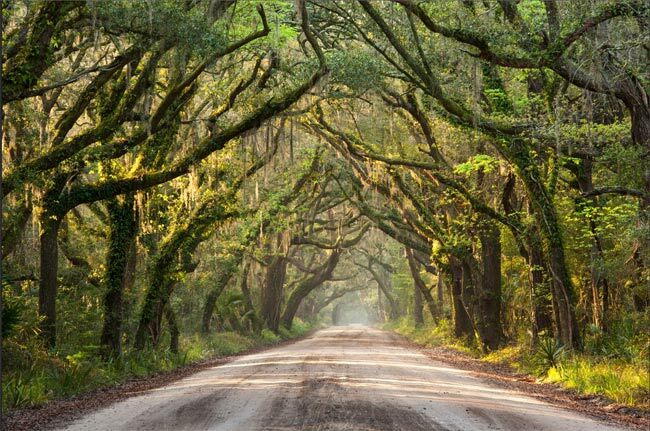 This is a beautiful description of the Live Oak Trees in South Carolina.